I keep showing pictures of Chia & Hemp Seed porridge in my Sunday week in review (since I eat it almost everyday) but I never actually posted the recipe. So here you go! 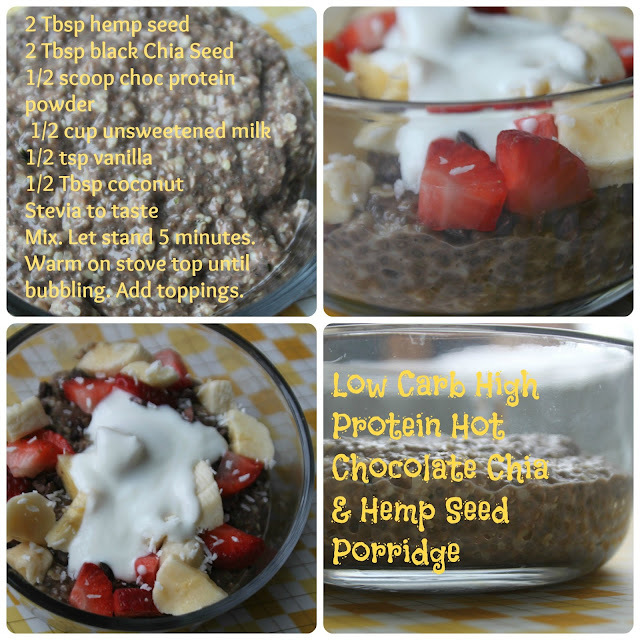 This is an amazingly CLEAN and HEALTHY way to start your day right. Full of healthy fat, protein and fiber. It will fill you up and give you a ton of energy without spiking your blood sugar. If you can't or don't want to kick off the day with carbohydrates but miss your hot oatmeal or toast, this is a great alternative for you. 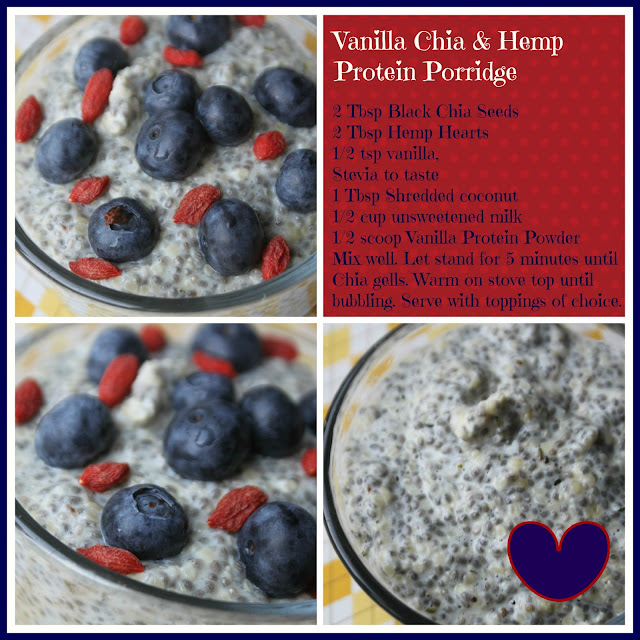 Here's the recipe for my Vanilla version............this one topped with fresh Blue and Goji berries! It is a really versatile recipe. Use any milk you want - almond, coconut, hemp. I know its a big faux pas as most clean types are anti-soy but I use organic, non-ge unsweetened soy milk. I always switch between vanilla and chocolate protein powder depending on what I'm in the mood for. Click here for lots of examples of toppings you might want to try. For chocolate porridge I like a bit of unsweetened Greek yogurt with fruit, coconut and/or cacao nibs. For vanilla porridge I change it up depending on the day and what's in my fridge. You can do raisins/apples/cinnamon, berries/coconut/yogurt, banana's/coconut/cacao. Get creative and you won't get tired of it. Hey, and if you don't do the protein powder thing just leave it out and replace with cocoa and/or extra vanilla. It still works fine! I love this recipe because if I can't finish all my breakfast I eat the rest for "dessert" later in the day. Yum! This is my chocolate version. I usually top it with a bit of banana - I love the combination of banana and chocolate. Double Yum Mum!